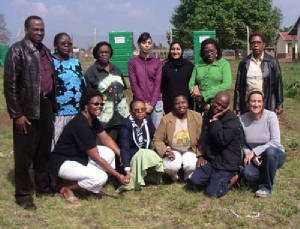 In June 2006, CWP Director, Karen Hartman, and consultants Sheila Kaehny and Stevi Quate spent 2 weeks in Dundee, South Africa, at the invitation of the South African Writing Project, working with teachers in the township schools there. They worked at a high school in the township with about 35 teachers over 10 days. CWP had sponsored two teachers from Dundee the previous summer, Sizwe and Mpume Mchunu, to come to Colorado and participated in the summer CWP I workshop. They each spent an additional two weeks helping two of our consultants teach CWP I, so that they experienced the course both as student and teacher. The South African North Star Writing Project helped arrange for CWP to come to Dundee in to work directly with a larger group of teachers.